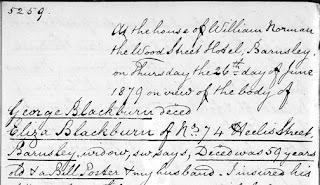 When a friend contacted me to say that the Wakefield Coroners' Notebooks were now available on Ancestry I must admit that my reply was, "There are not enough hours in the day!" So many new record sets appear every month now that keeping up with them for my own family history is just impossible. Happily, when I attended a meeting of the Cudworth Local History and Heritage Group yesterday BS persuaded me to take a look, explaining that the records ran right up to 1909 and did cover Barnsley. Most of the cases seem to take place in public houses which gives a fascinating insight into the lifestyle of our ancestors - but it might take a while for me to investigate that angle of this new record set. I did a quick search for one particular death in the OH's family that I knew had been the subject of an inquest. William Henry Blackburn had been killed within six months of his marriage to Mary Ann Loveland in 1871, leaving her expecting their first child. They were the OH's 3x great grandparents and William's posthumous child, named after his father, born in July 1872, was the OH's 2x great grandfather. Mary Ann re-married three years after William's death and went on to have seven more children with her second husband Walter Jobling. I have taken a snip of the header of the report into his death so you can see the style and the old handwriting, but I have transcribed it in full below. Today I started a proper search of the records looking for family names in Barnsley and soon found another unfortunate member of the same family. 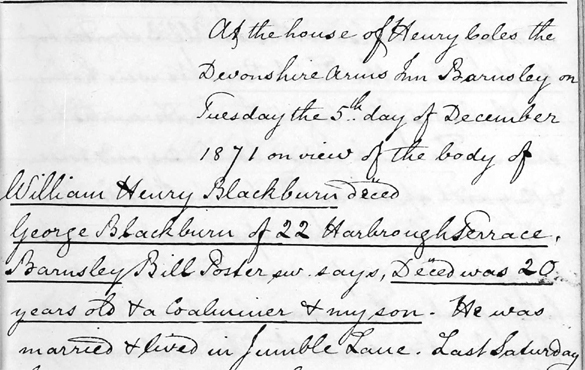 William's father George Blackburn, who was a witness in the investigation into his son's death, himself featured in a Coroners Report in 1879. How terribly sad for his wife, who had to give the first statement in this case. She had lost her eldest surviving son and her husband within eight years of each other. George Hirst of Silver Street Barnsley Coalminer sw. says, On Friday the 24th ulto deced & I began a Bank on the South side of High Stile Colliery, Barnsley. Last Friday morning about 6 o'clock we went to the Bank when Josh Bryan told us all was right. We found the shovel marked with the day of the week. Isaac Midgley was also with us. All 3 started ?? to get coal in the Thick Bed. We were holing in the low "softs" to get the "hards" or middle seam. The bank was about 12 yards wide & 12 yards up & it was fast at both ends. There was a row of wooden props about a yard from the face. The props were about a yard & a yard & a half apart. There was a level on the top side of our bank driven to the Throw about 20 yards off. Deced was between me & Midgley & had continued to work while I & Midgley were filling a corf. Suddenly about 3 yards in lenght of the "hards" fell forward & knocked deced down. He was straight out & covered with coal up to his middle. The coal was in one lump & we prized it up with sleepers. Deced could not stand. We continued to work the day out. When I first began my husband's family tree I was suspicious of William's death at twenty years of age. I was lucky enough to find a short paragraph relating the event in the Wakefield Express of 9 December 1871 at the Local Studies Library in Wakefield. I now know that that piece must have been taken from this very Coroner's Report as the wording is almost the same. I subsequently sent for William's death certificate which notes that he lived 3 days after the accident (the accident was on the Saturday and he died on the Monday) and that he died at 22 Harbrough Terrace (I think the wording of the Coroner's report doesn't make that clear). 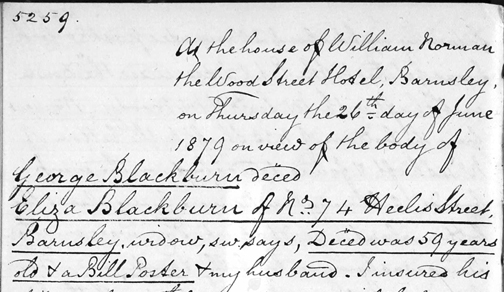 William Henry Blackburn was buried in Barnsley Cemetery on 7 December 1871 in plot M 539 where he was later joined by his wife's second husband Walter Jobling! 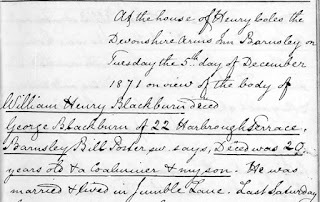 "At the house of William Norman the Wood Street Hotel, Barnsley, on Thursday the 26th day of June 1879 on view of the body of George Blackburn decd. Eliza Blackburn of No 74 Heelis Street, Barnsley, widow, sw. says, Deced was 59 years old & a Bill Poster & my husband. I insured his life on the 12th November 1877 with the United Kingdom Assurance Corporation Limited for £6:12:0 but in the name of George Blackbourn. On Saturday the 7th inst he got up early & set off to his Office & he was brought home in a Cab in the afternoon. He was carried from the Cab to his bed upstairs. He said that his back and abdomen were injured. Albert Wm Rogers came twice to see deced. Deced told me he had been riding with Rogers & expected they could get under an archway. Mr Scott attended him. Deced gradually became weaker as he could not take nourishment & he died yesterday evening about 6 o'clock. Jane the wife of Joseph Asquith of No 33 Wood Street, Barnsley, Stonemason's Laborer, sw. says, I have known deced many years. I saw him in a chair at his own house in the afternoon. His sons carried him in the chair upstairs & I helped to put him to bed. I have frequently seen him since. Last night I washed & laid out his body which had become very thin. There was not any external mark of injury. Paid Wm Mansfield PS £1:0:6 Persl exps." The map snip to the right is from an 1889 town plan of Barnsley. It shows the exit from the top of Graham's Orchard at the bottom right adjacent to the Lord Nelson Inn (the shaded X indicates an archway or entrance on the ground floor). Opposite and a little way up Shambles Street (which crosses the map at the bottom) looking to the left is the entrance to the Windmill Inn Yard. The next entrance along is beside the White Bear Inn. It is tricky to interpret the testimony of the driver of the van, Albert Rogers, but I think it means that he entered the Windmill Inn Yard, drove straight through exiting onto Westgate (at the top of the map snip) then turned his van round and entered the Old White Bear Yard from Westgate. The entrance at the front of the Old White Bear was far too low for anyone to expect a horse and cart to enter. There is a photo of that stretch of Shambles Street on YOCOCO, Barnsley Council's photo archive, looking down from the Sovereign Inn next door to the Old White Bear. Of course I could be wrong and he just started to enter the Windmill Inn Yard, pulled up and tried to enter the Old White Bear Yard at the front! At least the pub was handy for a quick snifter of brandy after the accident. We can see that George and Eliza had moved from Harbrough Terrace to Heelis Street between the deaths of William Henry in 1871 and George in 1879. The testimony of the neighbour mentions George being carried upstairs by his sons. I only know of one son, James Blackburn, alive at this time, but the other man could have been his son-in-law William Hinchliffe. George was buried in Barnsley Cemetery on 29 June 1879 in plot M 538, adjacent to his son's burial plot. Three little Hinchliffe grandchildren share the plot with him and finally Eliza his wife, who had married to a chap called Thomas Ashurst eight years after George's death, joins him there in 1902 at the age of 74 years. I am not aware of a gravestone on either plot. Who knows what else I will find in these Coroner's reports? You certainly get a lot of information in them and I am so glad I was persuaded to take some time and have a look! I find this very interesting and sad.